High-protein lean gainer. 650 Calories; 60 g Protein; 85 g Carbs; 25 Vitamins & minerals. Naturally and artificially flavored. The bigger picture of lean gainers. Don’t judge a gainer based solely upon its calories per serving. Because when it comes to gaining lean mass, not all calories are created equally. Unlike typical weight-gain formulas that are loaded with simple sugars and fat, Pro Complex Gainer derives a much higher percentage of its calories from protein-7 premium protein sources to be exact. By also supplying complex carbohydrates, dietary fiber, medium chain triglycerides (MCTs), digestive enzymes, vitamins, essential minerals, and great taste as well, we’ve created the ideal lean gainer. Pro Complex Gainer was made with quality, not quantity, in mind. Because we understand that you want to get big, not fat. The ingredients that make up the mass. High Quality Proteins: Pro Complex Gainer is comprised on high biological value proteins, which means they are easily digested and absorbed so they provide a full complement of amino acids to support the rebuilding process. Each serving of Pro Complex Gainer provides a 60-gram dose of premium muscle-building protein made from 7 unique sources. Complex Carbohydrates & Lipids: Carbohydrates and lipids (fats and oils) provide sustained energy that help prevent proteins from being burned off as fuel. Each serving of Pro Complex Gainer provides 85 grams of carbohydrates and 4 grams of fiber with only 5 grams of sugar. In addition Pro Complex Gainer supplies medium chain triglycerides (MCTs) and other energy-dense lipids. Micronutrients: Various vitamins and essential minerals are utilized during the growth process. Without these micronutrients your body cannot effectively process proteins, carbohydrates, or fats. Each serving of Pro Complex Gainer provides 25 vitamins and essential minerals. Calories: To gain just one extra pound, you need to consume approximately 3500 calories-above and beyond what you normally consume through foods, beverages, and supplements. Pro Complex Gainer provides over 600 calories per serving. By adding just one serving to your daily routine, you can begin to experience an increase in lean mass within the first week. Pro Complex Gainer: Quality mass through premium proteins and nutrient-dense calories. 16 Ounces of skim milk adds 170 calories, 16 grams of carbs, and 0 grams of fat. Contents sold by weight, not volume. Serving scoop included but may settle to the bottom during shipping. Carefully manufactured in the USA. Spoon Stirred: Just add one heaping scoop of Pro Complex Gainer to a glass filled with 16 oz. of water, nonfat milk or your favorite beverage. Then mix it up with a spoon. Stir for about 20 seconds or until powder is completely dissolved. Shaker: Just add one heaping scoop of Pro Complex Gainer to your shaker cup and then pour in 16 oz. of your preferred beverage. Cover and shake for 2030 seconds. Tip: Mixing one scoop with 68 fl. oz. of nonfat milk instead of water will give you a thicker, creamier shake. Blender: Add one heaping scoop of Pro Complex Gainer to a blender filled with 16 oz. of water, nonfat milk, or your favorite beverage. Blend for 3040 seconds. Then add a few ice cubes and blend for an additional 30 seconds. Pro Complex Gainer is a superior supplement that can be used to support high-calorie needs in a variety of ways. Between Meals: Drink 12 servings of Pro Complex Gainer between meals to maintain positive nitrogen balance and support a high-calorie diet. Post-Workout: Begin drinking one serving of Pro Complex Gainer 3060 minutes following exercise to support maximum recovery. Before Bed: Drink one serving of Pro Complex Gainer about 4560 minutes before bed to provide nutrients to recovering muscle throughout the night. Note: For best results use Pro Complex Gainer combined with intense weight training (35 times per week) and a sensible diet. Also, keep in mind that sufficient recovery between workouts impacts your ability to gain lean mass. Allowing at least 48 hours between workouts involving the same body parts is recommended. As a general rule, consume approximately 1 gram of protein per pound of body weight per day, spread over 57 meals and/or supplements. Store in a cool, dry place. 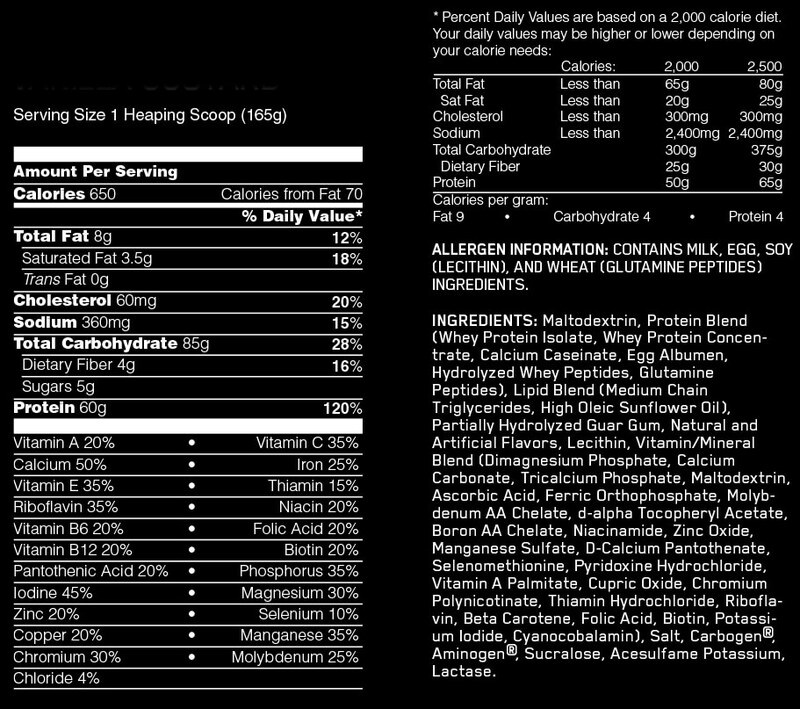 Allergen Information: Contains milk, egg, soy (lecithin), and wheat (glutamine peptides) ingredients. Keep out of reach of children. Diabetics and hypoglycemics should only use this product under the advice of a qualified, licensed physician or dietician. Contents sold by weight, not volume. Some settling may occur.